After completing this training your MLO’s and processors won’t go into a panic because the borrower states their self employed. An important part of originating and processing loans is understanding how to properly qualify self-employed borrowers. The trick is to understand and analyze tax returns without becoming an accountant. Our best estimate is that 80% of all self employed borrowers are either Subchapter S or Limited Liability Corporations. For qualifying purposes they’re both handled the same way. You don’t need to take an accounting course to be confident about qualifying the self-employed borrower. Capstone’s training is always there for you. 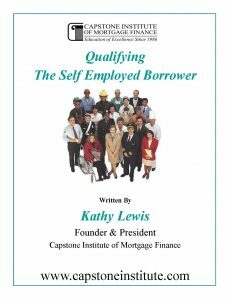 Your instructor Kathy Lewis gets right to the point of what you need to know and how to calculate your borrower’s real qualifying income. Using simulated tax returns all the mystery will be removed from gathering the borrower’s real income. This 3.95 hour Online Self-Paced video training is synchronized to your technical manual and your downloadable PDF file case studies and handouts. Your training materials include sample tax returns on legal downloadable PDF file which contains your tax return case studies. You will need 53 pages of legal; 11X 17 to print off your case studies or you can save the PDF file to your desktop. FHA 203 (k) – Become A Specialist Before Your Competitors Do! As one of the very first mortgage education centers, Capstone and our instructors have helped set the standard for mortgage education, training and preparation for industry-related exams.